This investigation can be paired with a unit on ecology, energy, and food webs. Students open owl pellets to reveal the skeletons and fur of the owl’s last meal. Students collect data on what they have found and then reconstruct the skeletons using an bone chart. 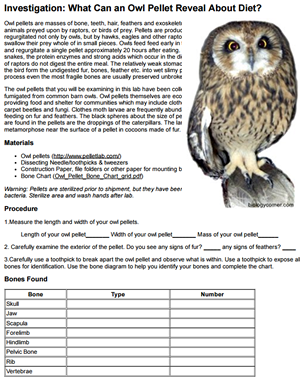 An analysis asks students to summarize what they have learned about the eating habits of the owl and to construct a food web.